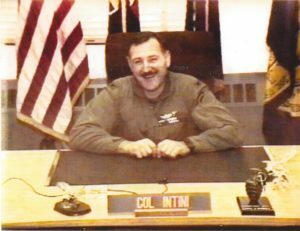 Colonel (R) Frank P. Intini Jr. was born in Queens New York. He enlisted in the NYARNG in January 1964 while he was a senior in high school. 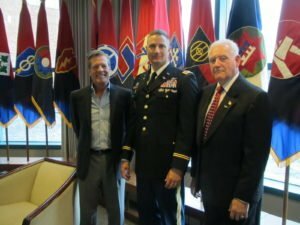 He served as an enlisted Soldier and aircraft mechanic, and graduated from Officer Candidate School in 1969, earning his commission as a Second Lieutenant in the Infantry Branch. His military education includes the Infantry Officer Basic Course; Transportation Officer Advanced Course; U.S. Army Command and General Staff College; Aviation Command and Staff Officer Course; U.S. Army War College; Rotary Wing Flight School; Aircraft Maintenance Officer Course; UH-1 Helicopter maintenance Test Pilot Course; OH-6 Helicopter Maintenance Test Pilot Course; UH-1 Instructor Pilot Course; Aircraft Accident Prevention Safety Officer Course; Joint Firepower Control Course; and the National Security Course. During his military career, COL (R) Intini served in a broad range of command and staff assignments including Platoon Leader, A Co, 42nd Combat Aviation Battalion; Operations Officer, 42nd Combat Aviation Battalion; Commander, F Co, 42nd Maintenance Battalion; Commander, B Co, 42nd Combat Aviation Battalion; Executive Officer, 42nd Combat Aviation Battalion; Commander, 42nd Combat Aviation Battalion; Commander, 42nd Combat Aviation Brigade; Director of Aviation and Safety for the NYARNG; and Liaison Officer, Southern Tier, NYARNG. 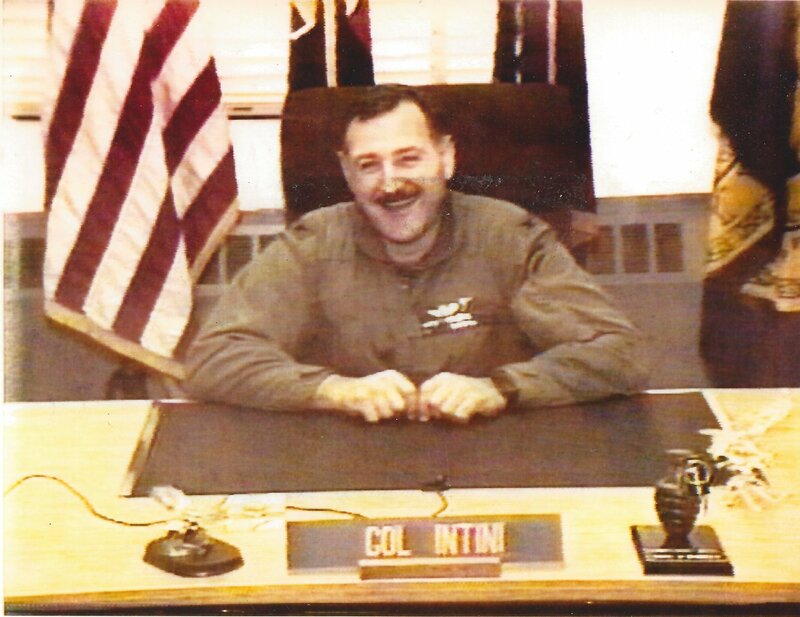 COL (R) Intini also served as Commander of Army Aviation Support Facility #1 on Long Island. 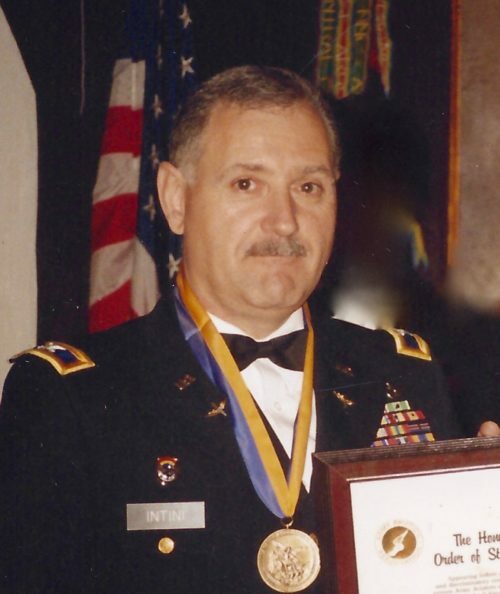 COL (R) Intini’s awards and decorations include the Meritorious Service Medal (5th Award); Army Commendation Medal (2nd Award); National Defense Service Medal (2nd Award); Army Achievement Medal; Army Reserve Component Achievement Medal (8th Award); Armed Forces Reserve Medal (3rd Award); Army Service Ribbon; Army Reserve Component Overseas Training Ribbon (2nd Award); NYS Conspicuous Service Medal (2nd Award); NYS Meritorious Service Medal (3rd Award); NYS Military Commendation Medal (2nd Award); 35 Year Long and Faithful Service Medal; NYS Recruiting Medal with device; NYS Aid to Civil Authorities Medal (9th Award); NYS Exercise Support Medal; NYS Humane Service Medal (4th Award); NYS Medal for Military Support 1980 Winter Olympics; Master Army Aviator Badge; NGB Major General Francis S. Greenlief Award for Aviation Excellence; NGB Eagle Award for Excellence in Environmental Compliance; Secretary of the Army Environmental Quality Award, individual; Secretary of Defense Citation for Meritorious Achievement in Environmental Quality; Order of Saint Michael Bronze Award, Army Aviation Association; Order of Saint George Award, Armor Association. Frank Intini left the uniformed service in April 2000 and started working at Fort Hamilton on July 1, 2000 as the Alternate Project Manager for City Wide. In January 2001, he became Project Manager for Meridian Management Corp and the new BASOPS contractor on post. On October 1, 2008, Frank was named Project Manager for RBS, Inc. when they became the new BASOPS contractor. During his tenure as Project Manager at Fort Hamilton, he led his team to win the world-wide competition for the IMCOM DPW Support Contractor of the Year Award on two occasions; once in 2005 with Meridian Management Corp., and again in 2012 with RBS Inc. During his service as Project Manager, Frank received the Commander’s Award for Public Service; Achievement Medal for Civilian Service; and he and his team received numerous Certificates of Appreciation, Certificates of Recognition, and commendations from the Garrison Command, DPW, the Army Corps of Engineers, and the New York Military Entrance Procession Station (MEPS). COL (R) Intini is survived by his wife B.J. of West Babylon, NY, their two children, COL Frank P. Intini III, U.S. Army, and LTC Vincent P. Intini, U.S. Army, Retired, and three grandchildren Frankie, Mark and Vanni. In lieu of sending flowers, the Intini family has requested donations to the Fisher House Foundation. Click Here to donate to this cause. COL Frank P. Intini Jr. was both a mentor and a second father to me. I attribute much of who I am from the guidance and advice he provided. 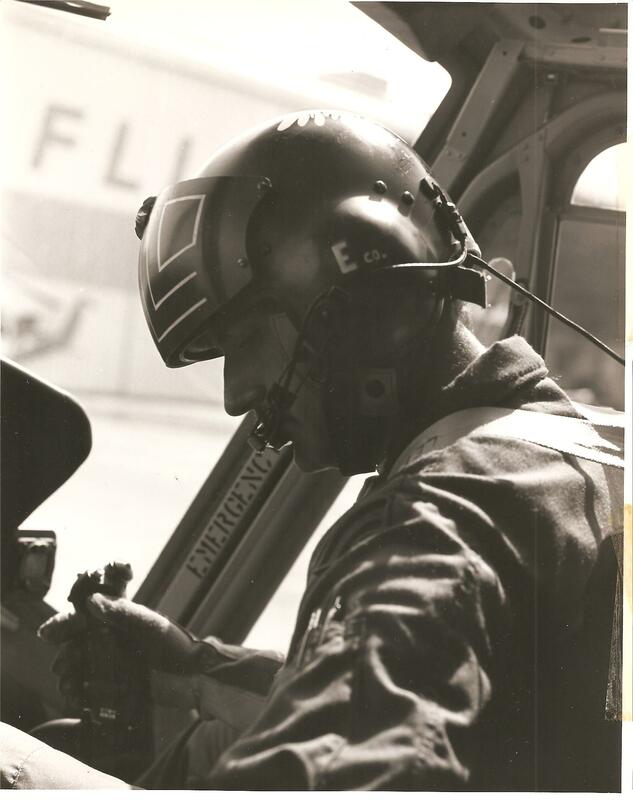 I recall those early years when I was a second lieutenant, inexperienced and confronted with challenges unique to aviation officers – his guidance provided clarity, built on the values my parents taught me, and developed me into a reliable ethical leader. Over the 30 years we worked together our relationship turned into a friendship and I was lucky to have known him. He became a grandfather to my twins. Truly one of a kind, I have never met anyone like him and expect I never will. It’s a sad day for the Settino’s, but I will carry a piece of him with me for as long as I live. He was my boss at AASF#1, It was an honor and pleasure to work for him. He was tough, and fair. When you were wrong he let you know it. But when you were right he would fight for you. He was like a father to me. I remember watching on TV and saying that’s my boss! Boss was I proud of him! May perpetual light shine upon Frank. My thoughts and prayers are with you. Frank was a pleasure to work with and. Man who shared his knowledge to help others learn. COL Intini was a great man and always a pleasure to work with. A true servant and family man. Thanks for the memories, many of us are better people for having the pleasure to get to know you. There were two people that left a strong impression in my life. The first was my father, who was my best friend. The second was COL Frank P. Intini Jr. He was my superior, my mentor and my friend. 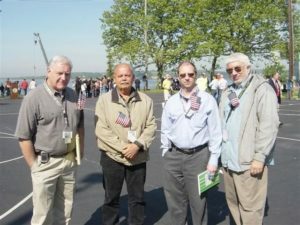 We traveled to and from Fort Hamilton for over 15 years. I had the privilege and honor of working for a man who truly loved his family and country. A man who dedicated his life to serve others. May God give you eternal rest. You will be missed my friend. I was very sad to hear about Frank’s passing . I worked with Frank at Meridian Management Corporation for years. He was a great man and real leader who became a true friend. God bless you and your family man. You are in a better place for sure. See you again one day soldier! There were two people that had a major impact in my life. One was my father. The other person was COL Frank P. Intini Jr. He was my superior, my mentor and my friend. We traveled together to Fort Hamilton for over 15 years. It was a privilege and honor to work for him. He was a man who truly loved his family and country. 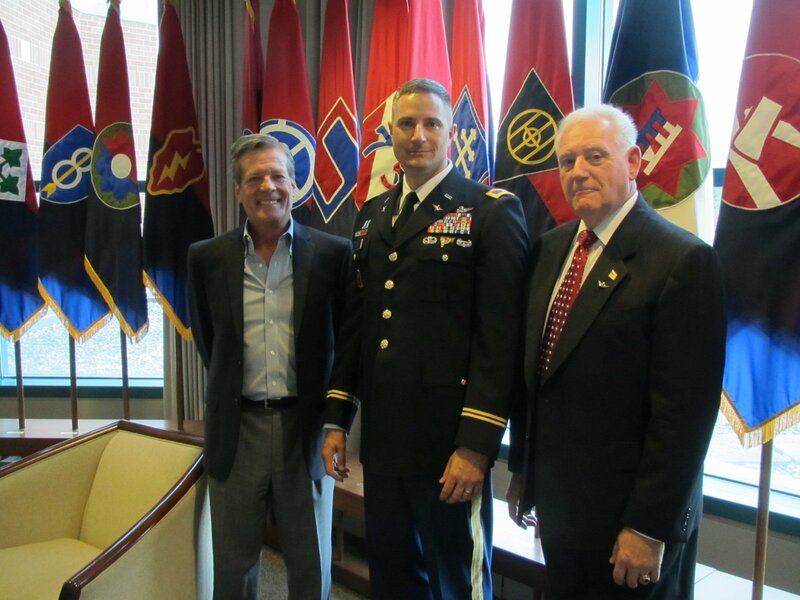 He dedicated his life in serving the military community. He believed in giving 100% in everything you do: working hard, do the best you can and provide for your family. May you rest in eternal peace. I will truly miss you my friend. COL Intini . You will be missed so much by Valerie and Lia because you welcomed them into your heart as your grandkids. We will always remember your gentle smile every time you saw them; specially dancing with the twins Andrea Bocelli’s music when they were babies. Our passion for the same music will carry on for ever in our hearts. You gave the girls an opportunity to have a grandfather that they never had, and there is no words to describe the love you filled their hearts with. Your death leaves us a heartache that nobody can heal, but the love leaves a memory that nobody can steal. We will always remember you and you never will be forgotten by the Settinos Family. RIP in Peace Grandpa Frank, (COL Intini). Cousin Frankie, you were always a role model to me, we shared the same birthdays but you have achieved it all in your great career and loving family, you will me missed..
May your soul rest in peas with God in heaven. Since 1983 you set an example for the both us to follow, it was our pleasure to work with you. You were a leader who led from the front, and you respected everyone no matter their rank or opinion. You will be missed. A great man and Leader. I worked for him on the TWA 800 Recovery mission. There were many trying and difficult times, but he had a great intuition for reading situations and people and applied the appropriate measures of leadership depending on the situation. I learned a lot from his mentor ship and watching his leadership style. It is a sad day to read about his passing. I am better for knowing him, as countless others can say the same. Thank you, Sir, Rest In Peace. My family and I had the honor of having Frank and B.J. Intini and their sons Frank and Vincent as neighbors and friends growing up. Years later, my parents still live down the street from them. I have many cherished memories at the Intini household and neighborhood gatherings as a child. Years later, Mr. and Mrs. Intini became an integral part of my wedding day. I would bring my own family to visit the Intini’s when visiting my parents. Frank Intini is a wonderful and remarkable man who will be greatly missed. Honest, Direct,Supportive, a good soldier and a fine Officer to serve with. May you find comfort in your memories and in the warm sympathy that goes out to you today. Deepest condolences to BJ and Frank III and Vincent and their families from the Brentwood High School Class of 1964. Frank was a wonderful classmate and kept us all in line on Hall Patrol. Great practice for his eventual military career. Rest in peace “Frankie”. 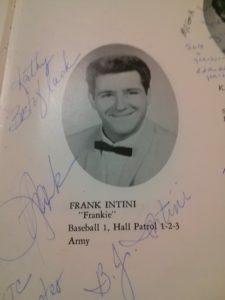 Frank in 1964 yearbook photo.